Altmetrics is an emergent research area whereby social media is applied as a source of metrics to assess scholarly impact. In the last few years, the interest in altmetrics has grown, giving rise to many questions regarding their potential benefits and challenges. This paper aims to address some of these questions. First, we provide an overview of the altmetrics landscape, comparing tool features, social media data sources, and social media events provided by altmetric aggregators. Second, we conduct a systematic review of the altmetrics literature. A total of 172 articles were analysed, revealing a steady rise in altmetrics research since 2011. Third, we analyse the results of over 80 studies from the altmetrics literature on two major research topics: cross-metric validation and coverage of altmetrics. An aggregated percentage coverage across studies on 11 data sources shows that Mendeley has the highest coverage of about 59 % across 15 studies. 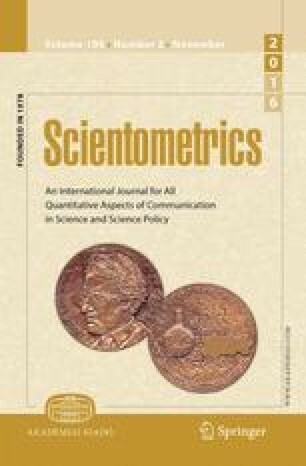 A meta-analysis across more than 40 cross-metric validation studies shows overall a weak correlation (ranging from 0.08 to 0.5) between altmetrics and citation counts, confirming that altmetrics do indeed measure a different kind of research impact, thus acting as a complement rather than a substitute to traditional metrics. Finally, we highlight open challenges and issues facing altmetrics and discuss future research areas. This research is supported by the National Research Foundation, Prime Minister’s Office, Singapore under its Science of Research, Innovation and Enterprise programme (SRIE Award No. NRF2014-NRF-SRIE001-019). In the following sections, an overview of the cross-metric validation studies discussed in “Results of studies on cross-metric validation” section are shown. Table 12 gives an overview of cross-metric validation studies that compare altmetrics to citations from CrossRef, PubMed, journal based citations , book citations, and university rankings. Table 13 gives an overview of cross-metric validation studies that compare altmetrics to usage metrics. Table 14 and Table 15 give an overview of cross-metric validation studies performed that compare altmetrics to altmetrics. In the following sections, the details of the results from the meta-analysis, answering research questions RQ2.1, RQ2.2, and RQ2.3 presented in “Results of studies on cross-metric validation”, are shown. Table 16 gives an overview of the studies covered in the meta-analysis. The results of the meta-analysis are shown in the following sections depicted as forest plots. In a forest plot, the study names of the studies considered in each meta-analysis are listed according to Table 16, including an additional index added to the name if several results were reported in a single study. For each study, the reported correlation value, the lower and upper limits, the Z-value and p-value are reported, as well as the sample size, i.e., the total number of data points (research artifacts) considered in the study. For each study, the measured correlation is represented by a black square. The size of the square depicts the study’s weight (according to sample size) in the meta-analysis. The horizontal lines show confidence intervals. The overall measured correlation from the meta-analysis is shown as a diamond, whose width depicts the confidence interval. When the studies are grouped, several diamonds are shown, each representing the overall measured correlation across the group. Figure 6 shows the results of the meta-analysis for Mendeley compared to citations, resulting in an overall correlation of 0.37, thus answering RQ2.1: 0.631 with Google Scholar (Li et al. 2011, 2012; Bar-Ilan 2012), 0.577 with Scopus (Schlögl et al. 2014; Haustein et al. 2014a; Thelwall and Sud 2015; Maflahi and Thelwall 2015; Li et al. 2012; Bar-Ilan 2012; Bar-Ilan et al. 2012), and 0.336 with WoS (Zahedi et al. 2014a; Mohammadi and Thelwall 2014; Mohammadi et al. 2015a; Li et al. 2011; Maleki 2015b; Zahedi et al. 2015a; Li et al. 2012; Priem et al. 2012b; Bar-Ilan 2012). However in response to RQ2.2, correlations with citations considering non-zero datasets was overall 0.547: 0.65 with Scopus (Thelwall and Wilson 2015b) and 0.543 with WoS (Mohammadi and Thelwall 2014; Mohammadi et al. 2015a; Sud and Thelwall 2015). In response to RQ2.3, Fig. 7 shows the results of the meta-analysis for Mendeley compared to other altmetrics. The overall correlation was 0.18: 0.016 with Amazon Metrics (Kousha and Thelwall 2015c), 0.557 with CiteULike (Li et al. 2011, 2012; Bar-Ilan et al. 2012), 0.031 with Delicious (Zahedi et al. 2014a), 0.309 with F1000 (Li et al. 2012), 0.070 with Twitter (Zahedi et al. 2014a), and 0.083 with Wikipedia (Zahedi et al. 2014a). The overall correlation with citations and altmetrics was 0.335. Answering RQ2.1, Fig. 8 shows the results of the meta-analysis for Twitter compared to WoS citations, resulting in an overall correlation of 0.108 (Haustein et al. 2015b, 2014b; Zahedi et al. 2014a; Priem et al. 2012b; Maleki 2015b). However, correlations with citations considering non-zero datasets (in response to RQ2.2) was 0.156: 0.392 with Google Scholar (Eysenbach 2012), 0.229 with Scopus (Eysenbach 2012), and 0.078 with WoS (Thelwall et al. 2013; Haustein et al. 2015b, 2014b). In answer to RQ2.3, the overall correlation with other altmetrics resulted in 0.151 as shown in Fig. 9: 0.194 with Blogs (Haustein et al. 2015b), 0.125 with Delicious (Zahedi et al. 2014a), 0.32 with Facebook (Haustein et al. 2015b), 0.142 with Google+ (Haustein et al. 2015b), 0.07 with Mendeley (Zahedi et al. 2014a), 0.137 with News (Haustein et al. 2015b), and 0.056 with Wikipedia (Zahedi et al. 2014a). Finally, the overall correlation with citations and altmetrics was 0.111. Figure 10 shows the results of the meta-analysis for CiteULike compared to citations, resulting in an overall correlation of 0.288: 0.383 with Google Scholar (Li et al. 2012, 2011), 0.257 with Scopus (Li et al. 2012; Liu et al. 2013; Haustein et al. 2015b; Bar-Ilan et al. 2012), and 0.256 with WoS (Priem et al. 2012b; Li et al. 2012, 2011) in answer to RQ2.1. As shown in Fig. 11 and in answer to RQ2.3, the overall correlation with other altmetrics resulted in 0.322: 0.076 with Blogs (Liu et al. 2013), 0.194 with Connotea (Liu et al. 2013), 0.127 with F1000 (Li et al. 2012), and 0.557 with Mendeley (Li et al. 2011). Finally, the overall correlation was 0.302 across citations and altmetrics. Figure 12 shows the results of the meta-analysis for Blogs. The correlation with WoS citations (Haustein et al. 2015b; Priem et al. 2012b) was 0.117 in answer to RQ2.1. However, correlations with WoS citations considering non-zero datasets (answering RQ2.2) was 0.194 (Thelwall et al. 2013; Haustein et al. 2015b). In answer to RQ2.3, correlation with other altmetrics was 0.14: 0.076 with CiteULike (Liu et al. 2013), 0.031 with Connotea (Liu et al. 2013), 0.18 with Facebook (Haustein et al. 2015b), 0.196 with Google+ (Haustein et al. 2015b), 0.279 with News (Haustein et al. 2015b), and 0.194 with Twitter (Haustein et al. 2015b). Overall across citations and altmetrics the correlation was 0.135. Figure 13 shows the results of the meta-analysis for F1000 compared to citations (in response to RQ2.1), resulting in an overall value of 0.229: 0.18 with Google Scholar (Li et al. 2012; Eyre-Walker and Stoletzki 2013), 0.278 with Scopus (Li et al. 2012; Mohammadi and Thelwall 2013), 0.25 with WoS (Priem et al. 2012b; Li et al. 2012; Bornmann and Marx 2015; Bornmann and Leydesdorff 2013).30 As shown in Fig. 14 and in answer to RQ2.3, the overall correlation with altmetrics resulted in 0.22: 0.127 with CiteULike, and 0.309 with Mendeley (Li et al. 2012). Finally, the overall correlation was 0.219 across citations and altmetrics. Figure 15 shows the results of the meta-analysis for Facebook across all studies. The correlation with WoS citations (Haustein et al. 2015b; Priem et al. 2012b) was 0.122, in answer to RQ2.1. However, correlations with WoS citations considering non-zero datasets and answering RQ2.2 was 0.109 (Thelwall et al. 2013; Haustein et al. 2015b). The correlation with other altmetrics was 0.202: 0.18 with Blogs, 0.144 with Google+, 0.161 with News, and 0.32 with Twitter (Haustein et al. 2015b), thus answering RQ2.3. The overall correlation across citations and altmetrics resulted in 0.182. Figure 16 shows the results of the meta-analysis for Google+. In response to RQ2.2, the correlation with WoS citations for non-zero datasets was 0.123 (Thelwall et al. 2013; Haustein et al. 2015b). Only one study investigated the correlation between Google+ and other altmetrics and citations (Haustein et al. 2015b). From that study, the correlation with WoS citations (Haustein et al. 2015b) was 0.065, thus answering RQ2.2. The overall correlation with other altmetrics (answering RQ2.3) was 0.165: 0.196 with Blogs, 0.144 with Facebook, 0.179 with News, and 0.142 with Twitter (Haustein et al. 2015b). The overall correlation across citations and altmetrics was 0.145. Figure 17 shows the results of the meta-analysis for Wikipedia. In answer to RQ2.1, the correlation with WoS citations (Zahedi et al. 2014a; Priem et al. 2012b) was 0.096. Overall with other altmetrics it was 0.053, thus answering RQ2.3: 0.021 with Delicious, 0.083 with Mendeley, and 0.056 with Twitter (Zahedi et al. 2014a). The overall correlation across citations and altmetrics was 0.076. Figure 18 shows the results of the meta-analysis for Delicious. The correlation with WoS citations (Zahedi et al. 2014a; Priem et al. 2012b) was 0.07, thus answering RQ2.1. Overall with other altmetrics it was 0.059 (answering RQ2.3): 0.031 with Mendeley, 0.125 with Twitter, and 0.021 with Wikipedia (Zahedi et al. 2014a). The overall correlation across citations and altmetrics was 0.064. Alperin, J. P. (2015b). Moving beyond counts: A method for surveying Twitter users. http://altmetrics.org/altmetrics15/alperin/. Accessed 18 Feb 2016. Bar-Ilan, J., Haustein, S., Peters, I., Priem, J., Shema, H., & Terliesner, J. (2012). Beyond citations: Scholars’ visibility on the social Web. arXiv preprint. arXiv:1205.5611. Davis, B., Hulpuş, I., Taylor, M., & Hayes, C. (2015). Challenges and opportunities for detecting and measuring diffusion of scientific impact across heterogeneous altmetric sources. http://altmetrics.org/altmetrics15/davis/. Accessed 18 Feb 2016. Henning, V. (2010). The top 10 journal articles published in 2009 by readership on Mendeley. Mendeley Blog. http://www.mendeley.com/blog/academic-features/the-top-10-journalarticles-published-in-2009-by-readership-on-mendeley. Accessed 18 Feb 2016. Lin, J. (2012). A case study in anti-gaming mechanisms for altmetrics: PLoS ALMs and datatrust. http://altmetrics.org/altmetrics12/lin. Accessed 18 Feb 2016. NISO (2014). NISO alternative metrics (altmetrics) initiative phase 1 white paper. http://www.niso.org/apps/group_public/download.php/13809/Altmetrics_project_phase1_white_paper.pdf. Accessed 18 Feb 2016. Priem, J., Taraborelli, D., Groth, P., & Neylon, C. (2010). Altmetrics: A manifesto. http://altmetrics.org/manifesto. Accessed 18 Feb 2016. Thelwall, M. (2012a). Introduction to webometric analyst 2.0: A research tool for social scientists. Statistical cybermetrics research group, University of Wolverhampton. http://webometrics.wlv.ac.uk. Accessed 18 Feb 2016.